Bear-market patience helped the Chicago Cubs make history. Baseball’s loveable losers snapped a 108-year World Series drought after midnight on Thursday morning, beating the Cleveland Indians in the final game of the seven-game series. Owner Tom Ricketts bought the team for a song in 2009 and has probably tripled his money. Ricketts swooped on the opportunity to buy the Cubs from Sam Zell’s bankrupt Tribune Co when the Chicago Tribune and L.A. Times publisher put the team up for sale seven years ago. Ricketts won an auction, paying $900 million for the franchise, its home ballpark Wrigley Field, and a minority stake in a local Chicago sports channel. In retrospect, it was a steal. The Cubs’ world-class brand, loyal fans, and presence in one of the biggest U.S. media markets meant the purchase had all the hallmarks of a Warren Buffett-style value investment. In Sage of Omaha-like fashion, Ricketts took advantage of Tribune’s distress and the fact that tight credit in the wake of the financial crisis made it hard for rival bidders to be competitive. The new owner pumped money into the enterprise even when it was at its lowest. Wunderkind general manager Theo Epstein, brought in from the Boston Red Sox, launched a painful rebuilding that sent the Cubs to the bottom of the National League Central division in 2013 and 2014 before a revitalized team came within four wins of the World Series last year. Ricketts has also been forging ahead with a $600 million plan to revamp the Cubs’ ballpark and surroundings that is controversial with some more traditional fans. They’ll probably forgive him now that Ricketts’ efforts have made the Cubs World Series champions at last. Forbes Magazine in March estimated the team was worth $2.2 billion, the fifth most valuable in Major League Baseball. Marc Ganis, a sports consultant who advised Tribune on the 2009 sale, pegs the franchise value at around $3 billion – more than three times Ricketts’ original investment. Winning for the first time since 1908 can only push that figure higher. But it didn’t come quick or easy. That’s a lesson for investors everywhere. 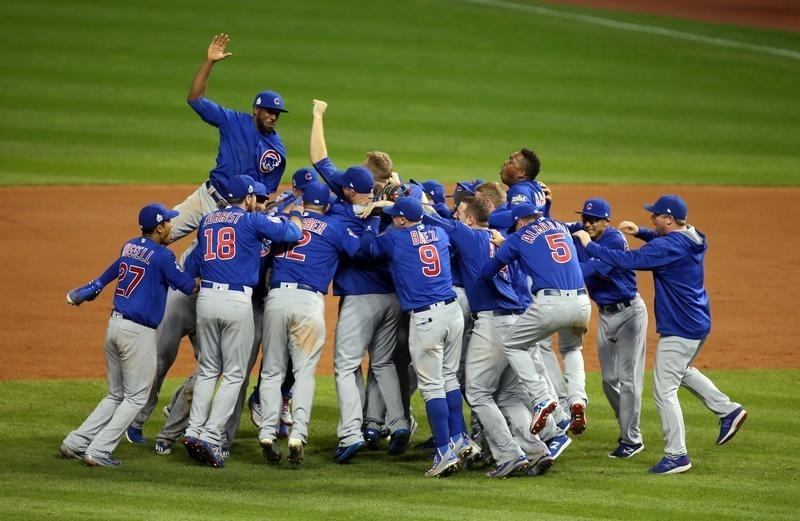 The Chicago Cubs beat the Cleveland Indians 8-7 in extra innings early on Nov. 3 in Cleveland, Ohio, to win their first World Series since 1908 and end the longest title drought in North American professional sports. Tom Ricketts, son of TD Ameritrade founder Joe Ricketts, bought the Cubs from Sam Zell's ailing Tribune Co for $900 million in 2009. The franchise could be worth as much as $3 billion today, Marc Ganis, a sports consultant who helped broker the 2009 sale, told Reuters on Oct. 27. Forbes magazine in March estimated the Cubs' value at $2.2 billion, the fifth highest in Major League Baseball.